While the workplace presents an awesome opportunity to change lives through our work, it can also be a place of a significant amount of stress and anxiety. This is why we all need some motivation every now and then to get us going. Here are a few messages to inspire you to craft a beautiful motivational message for your person of interest. A terrific attitude is like a magnet; it attracts your team members and brings out the very best in them. I hope you always remember to have it in your arsenal. Good morning! Make it your goal to make every day count, whether you and your team achieve very little or a lot, they will be happy to know that they made a difference. Good morning! Good morning! As you begin your day, let your passion be a guiding light for all your activities and interactions, and you will achieve your goals and objectives with ease and grace. Good morning! When things get tough and you feel like just giving up, take a moment to look in the mirror and tell yourself that you are more than capable of the task you’ve been given. All the best. 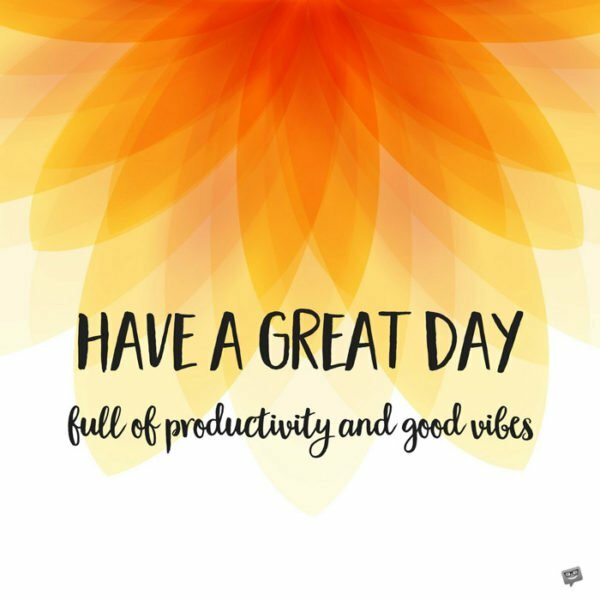 Wishing you a productive day! And may you always remember not to say or do anything when you are angry — it almost always leads to regrets. Good morning! I exhort you to see every misfortune as an opportunity to forge your own path to success. 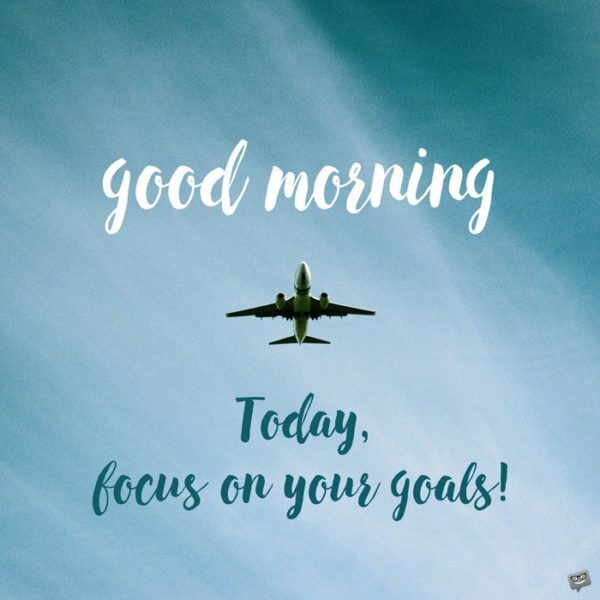 Good morning, and stay productive with your team! 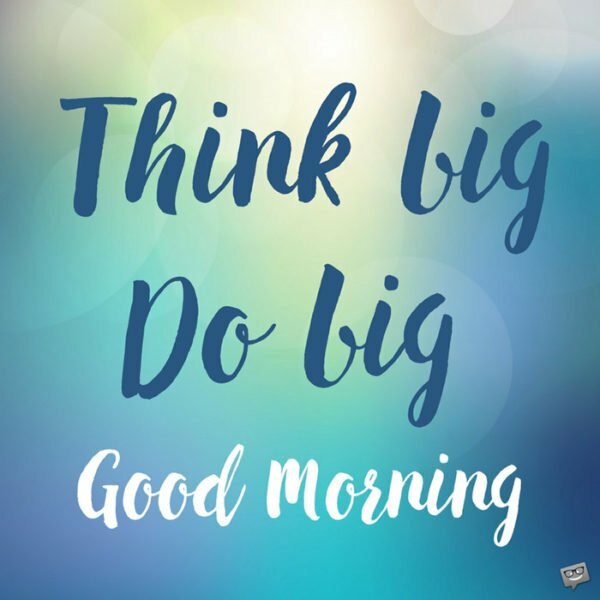 Think big, do big. Good Morning. How you start your day often sets the tone for the whole of it, so be sure to commence with a smile and a mind full of beautiful thoughts! 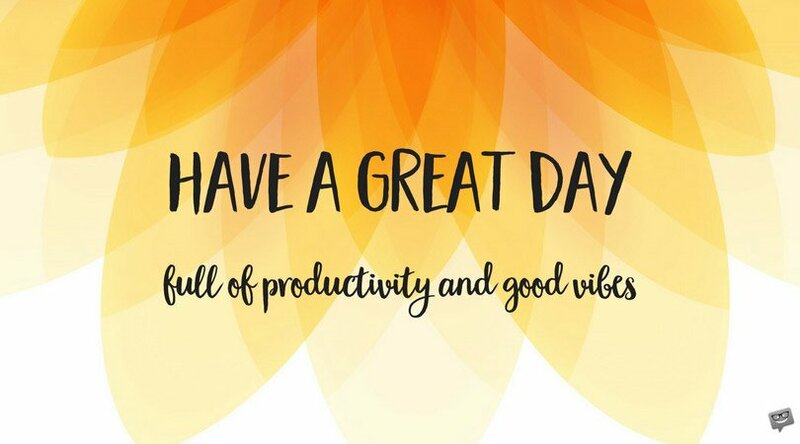 Good morning, and have yourself a productive day. When times get tough, remember to be thankful for your life, work, and the wonderful teammates around you. This will give you perspective to go strong. Good morning, and have an amazing day. Good morning, team! As we commence the day, I want to remind you that great thoughts do often lead to great outcomes. So let’s think and do big. Best wishes. See today as a new opportunity to make a difference, and you surely will. Good morning, and have a very fruitful day! Cease every opportunity that today presents you to make a life better through your work. May today be your best day yet. Have a blissful morning! Ours is an organization that believes in the innate power of a human being to make a difference. Let’s give life to our creed today by making a difference. Good morning! Today, I challenge you to stay focused on our mission and discover your purpose with each passing hour. 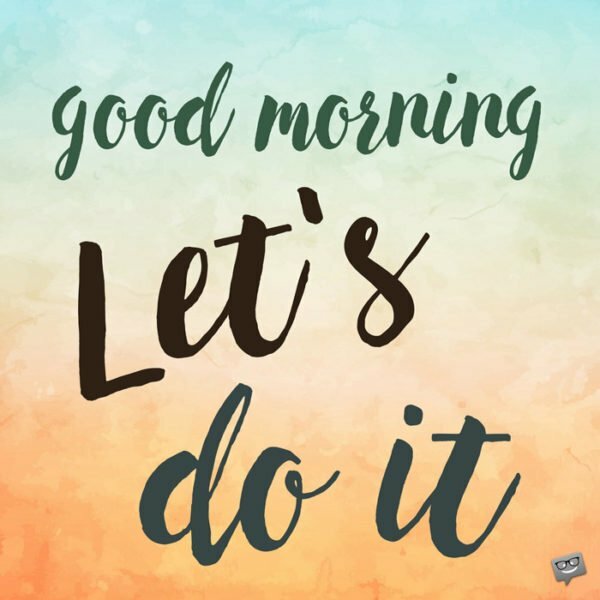 Good morning, and let’s get to work! You are with us today because you not only make a perfect addition to this team but also have something unique to offer. Go ahead and make your presence felt through your work. Good morning! I call on you to get over the mistakes of the past, worry less about the future’s uncertainties, and, instead, focus on what unique contributions you can make today. 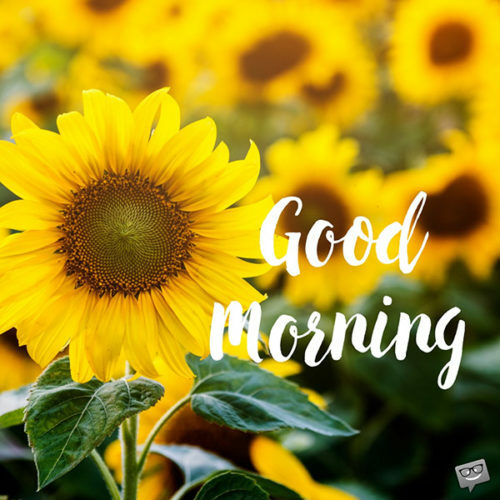 Wishing you a very beautiful morning and a productive day! Today, let us create more productive problems and solve them to the best of our abilities, for it is by doing so that our organization can make advances. Good morning. May we all enjoy a productive time at work. Whenever you feel like giving up, please remember the reason why you signed on in the first place, and get back up on your feet. Good morning, and never stop being an awesome secretary. I challenge you to be the master and captain of your fate because none but you knows better what you want to achieve on this job. Good morning, my amazing secretary. Have a great day. Full of productivity and good vibes. Your smile and amiable disposition make us want to come to work every day. You simply rock and are at your best when it comes to correcting the fault in our stars. Good morning, madam secretary. Good morning! I just want to say hi and let you know that this office feels empty when you are not around. Keep on doing the wonderful work that you do for us. We treasure you. Many commend me for being a great boss, but what they don’t know is that I would be nothing without an amazing secretary like you. Thank you for playing a very instrumental role in my success. Good morning, and keep up your good work! You always burnish the corner where you are, and bring the best out of everyone you encounter. It’s always a pleasure working with you. Wishing a lovely morning and day to a truly outstanding secretary! Your colleagues and I hate to admit this but your cheerful demeanor, skill, and smile have made you our team’s sine qua non. Keep up this disposition, and your limit will be the sky! Good morning, boss. Managing people is no mean feat but you rise above expectations each day. Keep up the hard work, and you will see huge results at the appropriate time. Good morning, boss. Good Morning. 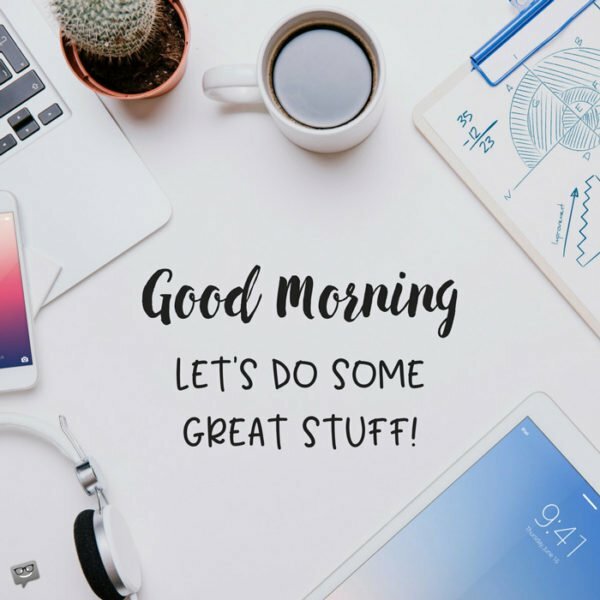 Let’s do some great stuff. Even the best of bosses need assurance that things will be alright. I want you to look at the amazing team you’ve raised among us, and use us as your inspiration to forge ahead. Good morning, dearest boss. Today, I encourage you to reach within and unleash that inner strength we’ve all known you to have. We are right behind you, working hard and supporting you every step of the way. Have a pleasantly beautiful morning, sir/ma’am. Good morning, sir/ma’am! I encourage you to look for the silver lining in everything today, for doing so will help you to overcome the stresses and disappointments at work. Cheers. Since your success is dependent upon your thoughts, I exhort you to think big and positive so that you will experience great outcomes. Wishing a beautiful day to one of the most amazing bosses I’ve ever had. Good Morning. Let’s do it! Whether we like it or not, obstacles will come our way. However, we must never let ourselves to be held down by them. Good morning to you, dearest! Wishing a beautiful morning to a really special client. You are different from others. Allow this remarkable difference to define you rather than confine you. Never stop celebrating the amazing person that you are! The things you do today are definitely what are going to light up your tomorrow. Good morning. Good morning! Please, don’t ever give up on the goals you have set for yourself, come what may. Keep pressing forward and you shall make it into the realm of success. When you have total confidence in yourself and give life your best shot, the whole world becomes yours for the taking. Keep moving on. Don’t stop. Good morning. Wishing a wonderful client a lovely morning! Start this beautiful day with the knowledge that the only way to soar beyond the sky is to let go of the things that weigh you down. Good morning! Let the bright light in you shine. Never let yourself live in the shadows of others and nothing shall stop your life from being a testimony at the end of the day. I wish you nothing short of a magical day! Believe in yourself and let your confidence silence those who deliberately try to silence you. Good morning! As you begin this beautiful day, never forget that you are a priceless gem who has the innate ability to achieve the impossible. Good morning! Good morning! The road might be hard, but don’t ever think of giving up for a second. Remember that the harder the journey, the more breathtakingly wonderful the destination and victory are. 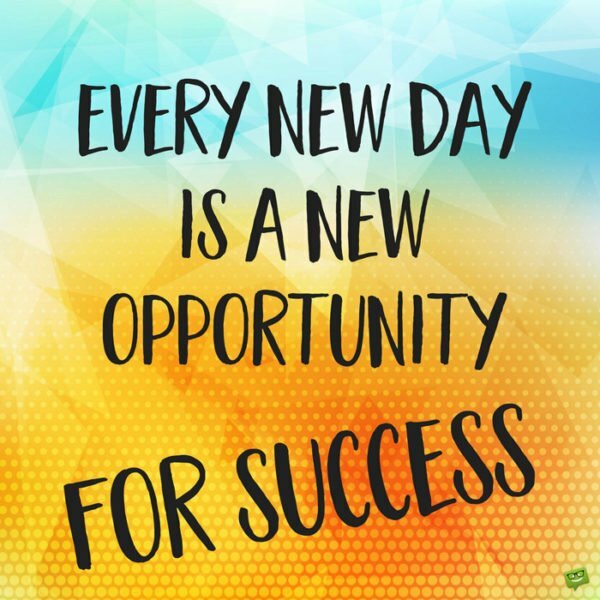 Every new day is a new opportunity for success. Never has life not been full of challenges. Love yourself, believe in yourself, and keep moving. This is the best way to overcome the obstacles that life comes rife with. Good morning. A barrier on your path isn’t the end of the road; push through it with faith and you shall definitely overcome it. Have a beautiful morning. Wishing a very beautiful morning to a remarkable business partner and friend. Remember that every road to success is full of obstacles and disappointments. Never let setbacks and failures stop you from turning your dreams into reality. History has taught us again and again that we don’t need to be perfect in order to enjoy a totally blissful day. Enjoy this beautiful brand new day to the fullest. Good morning! Transform all the obstacles you encounter today into your stepping stone to achieving remarkable things. Start today knowing that you alone are in charge of your choices. What does this mean? It means you alone decide how beautiful and sunny your day is. Stay positive and have an amazing day. No matter the difficulties you face today, just put a smile on your face and keep moving forward. If you do this, you’ll definitely get through whatever difficulty that comes your way. Have a lovely morning. Good morning, dear colleague. Faith in yourself will not only make the impossible possible, but it will also make achieving the impossible much easier. Keep on believing in yourself. I know you’ll have a wonderful day at work today because you are smart, hardworking and diligent. What a blessing it is to have you as a colleague! Good morning! Good Morning. We are all happy to have you with us! Things might not go the way you have planned them to go, but never give up hope. Always know that you can always rely on me to have your back. Have a beautiful day! Regardless of the number of setbacks that came your way yesterday, forget about them. 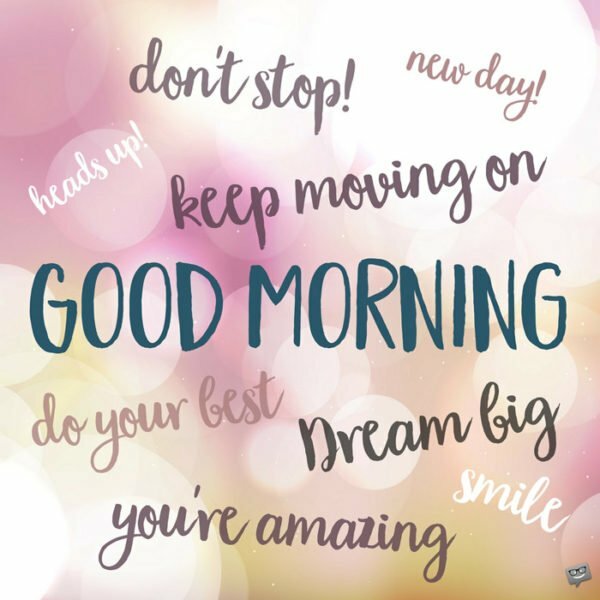 Today is a totally brand new day for you to start again and achieve great things. Good morning. When you arm yourself with determination, courage and faith, defeat is suddenly eliminated from the equation. Good morning. Have a ridiculously beautiful morning! Journey through this day never letting your background hold you down. 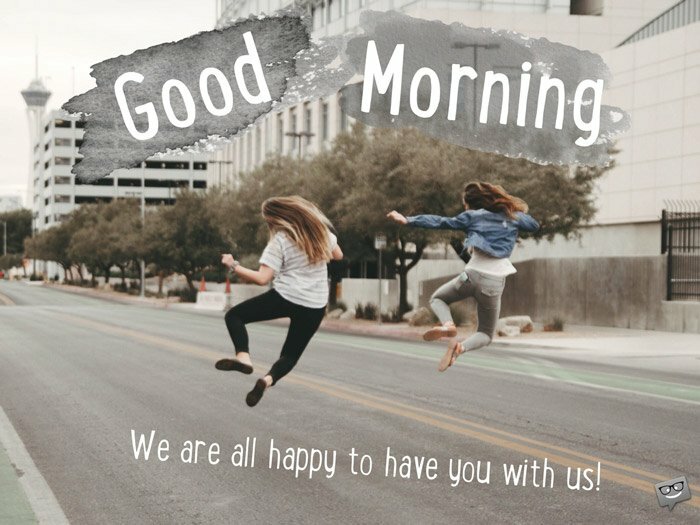 Wish you a fabulous morning! My advice for you on this beautiful day is to give zero attention to anything that tries to hold you back or bring you down. Stay positive. Good morning to you! The surest way to win in all spheres of life is to never doubt yourself. Welcome aboard and have yourself a tremendously nice day. We are all happy to have you with us! Dearest, you are the definition of hard work. I’m honored and privileged to have an amazing colleague like you. I wish you a truly wonderful and blessed day! Good morning, my new buddy and colleague! You shall prosper today because you are phenomenal. Wishing a rock n’ roll day to a truly awesome colleague. Believe in your abilities and every day of your life will be a memorable one. Good morning, dear. As long as I’m around, you’ll never feel alone at the workplace. 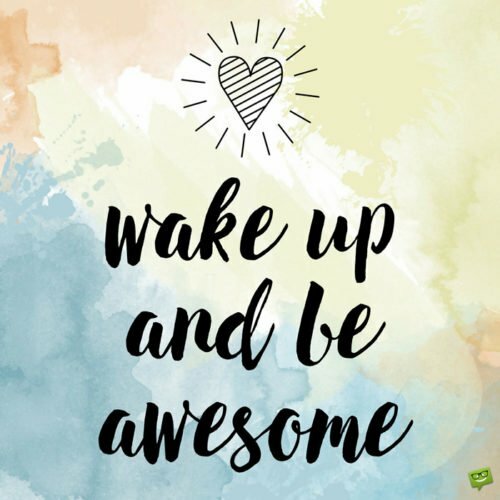 Have a ridiculously great day! The project might be taking forever to accomplish, but stay positive and keep your eyes on the ball. Success is just around the corner. Hope you have a gloriously lovely day. You were given this extraordinary project because you have what it takes to accomplish it in a way others can’t. Don’t ever give up. Have a beautiful morning. The task at hand might be taking too long to complete, but always remember that everything is achievable if you just believe. Keep pressing on and you’ll surely get to your destination! Good morning. Since time immemorial, there’s never been a shortcut to any remarkable destination. Stay on the course and you’ll achieve tremendous success with this project. Good morning. The project might still seem a long way from completion, but carry on with it with all the enthusiasm in the world knowing that Rome was also not built in a day. Wishing you an absolutely beautiful day. You may encounter a number of setbacks, but don’t let them discourage you. Never stop looking at the bright side and moving forward in faith. Good morning. Great achievements often take a good amount of hard work and sweat before coming to pass. I hope you always remember that as you work on this project. Good morning. Keep moving forward. Don’t let any challenges in your way throw you off-track or discourage you from getting to the finishing line. Have an absolutely lovely day. You might have not reached your destination yet, but don’t be discouraged. Remember that exceptional accomplishments always take time. Take it one step at a time and your accomplishments shall leave you marveled. Good morning!